Tom, I’m curious to see what the darker trim will do for you. The last house I did was gray and we stayed with the white trim which is a noticeable accent color. I am curious though about the cost of a new stucco color coat vs. painting. 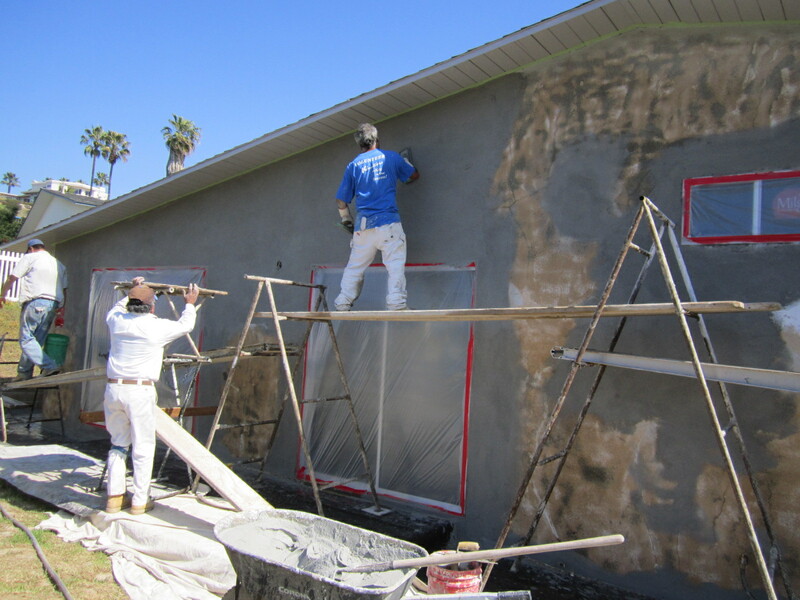 I know you said stucco shouldn’t be painted, but it’s what I’ve always done and I’m considering not doing it any longer, but haven’t priced it yet. Hey Bruce, The stucco job was 4,000. That includes the sandblasting and all the patchwork. That’s materials and labor. I’ve painted stucco before too. If you have to do it use elastomeric paint. 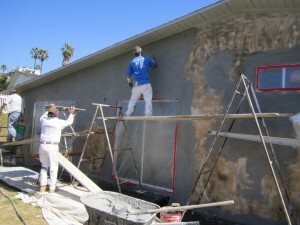 You cant spray it but it prevents cracking on stucco down the road. Tom, the suspense is killing me. I’m probably distorting your page visit count watching for an update. How did you calculate the effect of the frosted glass on the overall look when you selected paint? Do you have tips on how you select your colors? I’ve read all the usual ones about light, big swaths of test, etc. I still like to think there’s a secret I’m missing. I’ve tried color capture apps on my phone but they’re not accurate. And I notice material matters, too. I see stucco colors I like, but my house is mostly board and bat. Sorry not to have any suggestions on door levers. All the ones I like are pricey (so we don’t have any). Hey Halbert.. yea originally you might remember I was going down a different road with white stucco. I thought it might get too dirty and the more I looked online I liked grey modern houses. There were 3 stucco greys to choose from, one was way too light. One was dark but blueish and then there was mine. Greys aren’t really that hard, they are either pure white/black or in the blue or green family. Its hard though putting stuff together. The small samples at Home Depot are good to use ( I didn’t use them) but in this case I saw some stuff online I liked. I’m pretty sure after I change my beam color darker for $25 and 3 hours work that I’ll be happy with it. 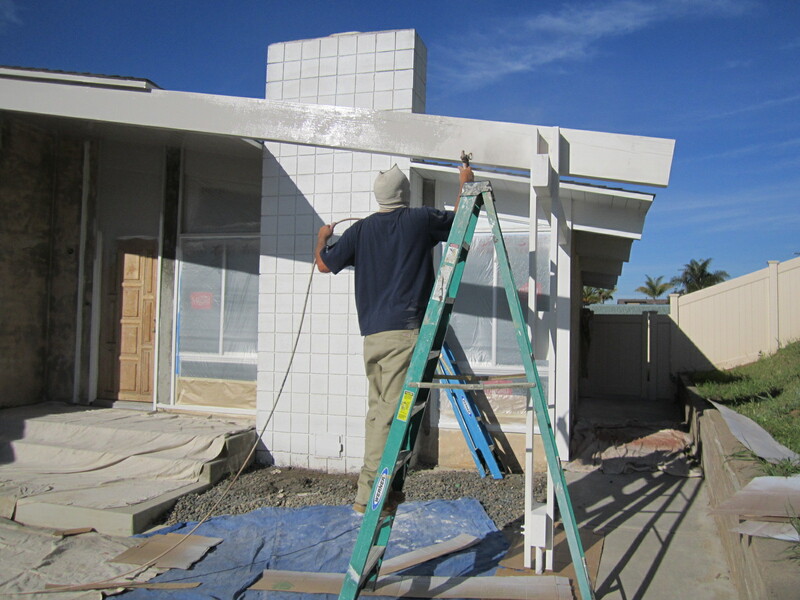 I didn’t account for the frosted glass but am just concentrating on how the brushed aluminum will look next to my stucco color and as long as I go darker for accent on the beams I’ll be ok. I just didn’t want to color block it up too much as modern houses are more simplistic. That’s why I didn’t paint the T&G white also. Bruce suggested white as a trim color earlier. White trim on grey body is very traditional and more beachy or cape cod IMO, just doesn’t hit the modern look. I’m still learning, picking colors is very hard but I learned a lot from our Texas designer who we used to work with (and still do for the next house). Material definitely matters. Rough surfaces like stucco darken from shadows. I’m going to show the front after shot once the garage and front door are on and i darken the beams: ) You have me worried now about those glossy grey doors from Ikea now.. that is the color I was going to do. Maybe at your house they are picking up the wall or countertop color? My second choice was the glossy white lower base cabinets and the new green uppers, would be fun but not too safe. PS that stucco is wet, it dried waaay lighter. To clarify: we used the high gloss gray on an media cabinet in a room on the north side of our house. We have natural red oak floors. Walls are white. The gray doors are extremely reflective and read more blue than black in our place. The glossy white doors seem very versatile. It will be so easy to swap out the doors later if someone wants a different look. I’m looking forward to seeing what you decide. Thanks for the link. I like it! What a great call to flip the sidelight on that entry door!